Micro-Grant in Action: TART Trails, Inc.
For the first time ever, LMB helped to foster the growth of bicycling initiatives around the state with the launch of a Micro-Grant Program. The response to the program was overwhelming. This year, LMB was able to narrow down the applicants to ten amazing organizations with unique programs that promote bicycling or bicycling safety in their area. We are pleased to share their stories and how the Micro-Grant funds are helping them further their own missions, moving us all toward a more bicycle friendly state. One of the Micro-Grant recipients is Recycle-A-Bicycle, a Traverse City program that restores bicycles and then redistributes them to area individuals who use this as their main source of transportation. In addition, they distribute refurbished bikes to area shelters for use as “house bicycles,” which clients use as a source of recreation and transportation. Their Micro-Grant was awarded to support their mission and services. Thank you to James Marinelli from TART Trails of Traverse City, MI for telling their story. For the past decade, Recycle-A-Bicycle(R-A-B) has provided over 1,500 bicycles to community members. 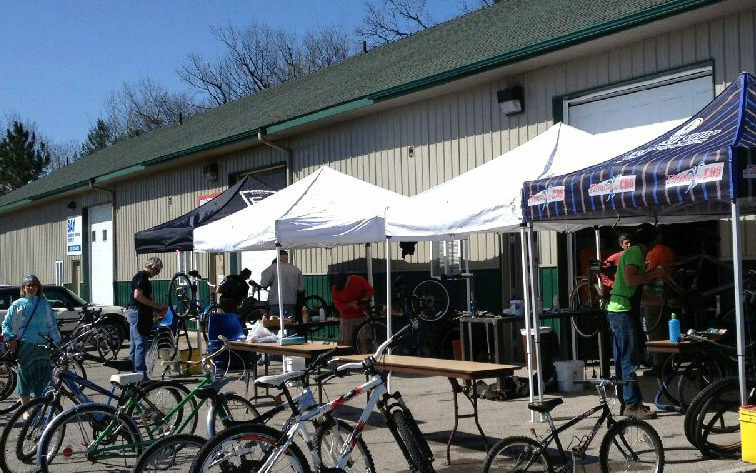 Our program’s yearly goal of providing at least 150 bicycles and 50 free repairs has proven to be a very attainable one; since only April of this year, we have supplied nearly 80 free bicycles, and have provided around 25 free repairs, to area residents. These repairs include mending flat tires, replacing tubes, truing and replacing bent wheels, shifters or brakes, replacing front and rear derailleurs, and providing full tune-ups with new bearings. The average cost for free walk-in repairs is under $45, and our labor is always done on a volunteer basis. 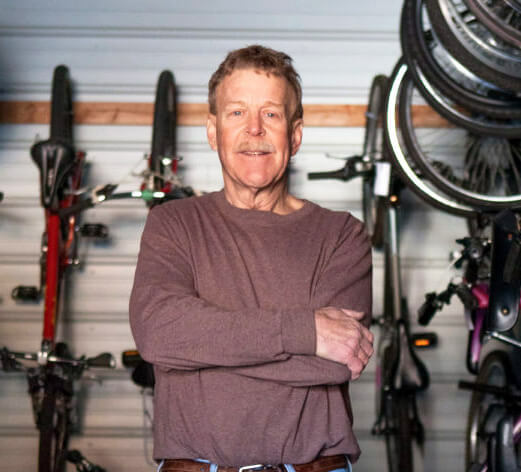 Of course, if a client wants to help with repairs, or if a client wants to learn how to repair and maintain his or her bicycle, our volunteers will assist them as needed. Maintaining such a busy operation takes both generous, monetary funding and a well-trained volunteer presence, so to that end, we have recently employed an AmeriCorps VISTA volunteer to assist in our outreach and fundraising efforts. Our VISTA has been seeking adequate funds, informing local client referral agencies (including Goodwill, Addiction Treatment Services, as well as private and public schools for at-risk children), and recruiting and mentoring volunteers. 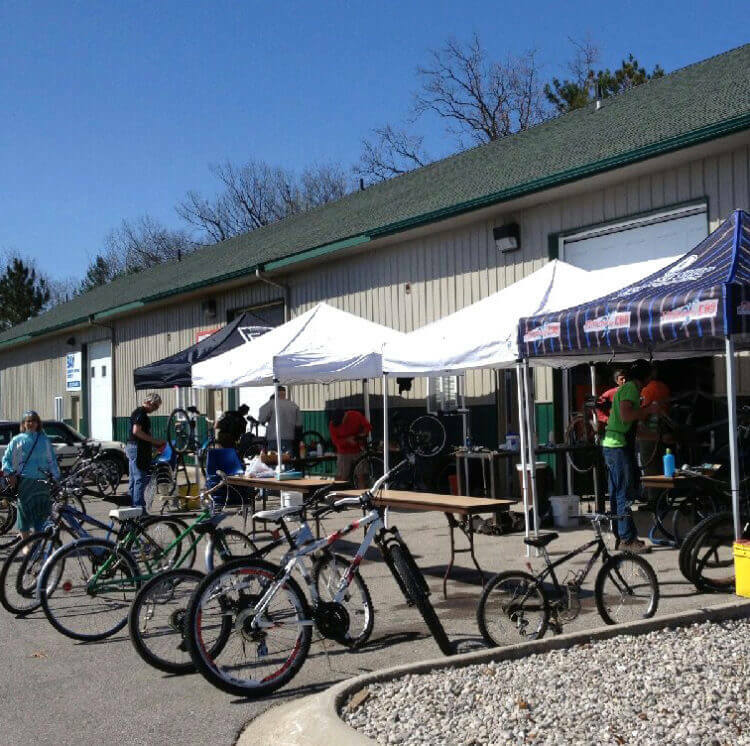 Through its work in refurbishing and redistributing donated bicycles to those in need, the Recycle-A-Bicycle program has enriched the lives of countless residents of Michigan’s Lower Peninsula. Because of this program, now in its eleventh year, at-risk area citizens now have the gift of transportation, recreation, and most importantly, the gift of independence.